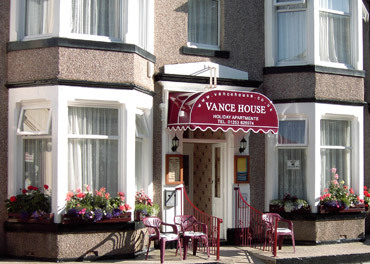 Vance House self catering holiday apartments in Blackpool are ideally situated in the heart of the town. The accommodation is a two-minute walk from Blackpool's Central Promenade and Blackpool Tower. If you want a holiday near the sea, to come and go as you please, and cater for yourselves with freedom, then a Blackpool holiday apartment is your answer. This would also make an ideal gift to a loved one, family or friend. A key is provided to your own holiday apartment and main door, so that you can come and go as you please. Families, couples and senior citizens only.